If you’ve been dreaming of an exotic vacation, this is the soap for you. 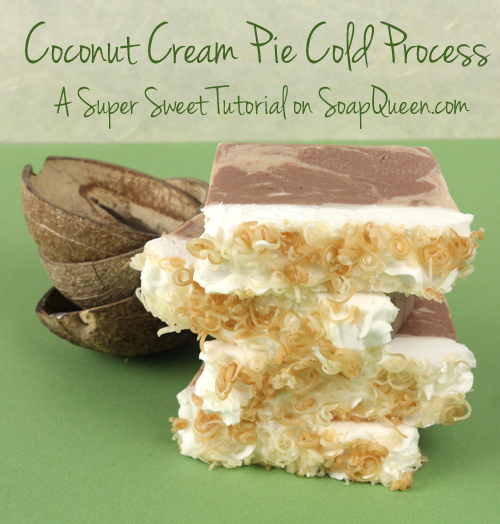 This Coconut Cream Cold Process tutorial is all the fun of a tropical beach getaway without the sand in your shoes! Made with 100% coconut water instead of distilled water, and featuring our brand new Coconut Cream Fragrance Oil, it’s a unique soap that smells as good as it looks. 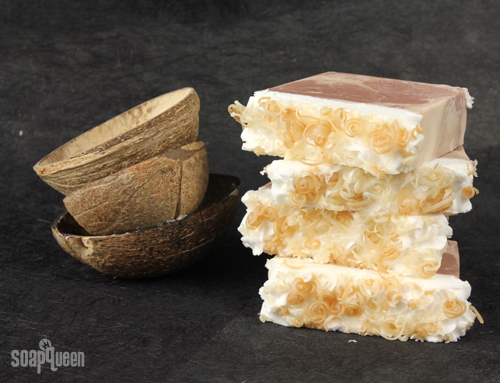 The top is finished off with melt & pour soap frosting and cold process “coconut flakes” to make this a truly decadent dessert soap. Speaking of sunshine, this week we’ve been showing you all kinds of tutorials to give your skin that radiant glow perfect for a summer get away. Check out the Beautiful Bronze Lip Tint, Bronze Goddess Nail Polish and Magical Bronze Shimmer Stick. As a bonus, a few of the ingredients in the tutorials are 20% off as part of this month’s web specials! COLOR PREP: To ensure that the Titanium Dioxide blends smoothly into the soap batter, we recommend micronizing it before dispersing it in oil. To micronize colorant, simply use a coffee grinder to blend the colorant to break up any clumps of color and prevent streaks of white from showing in the final soap. I like to use a coffee grinder that has a removable, stainless steel mixing area for easy cleaning. Then, disperse 2 teaspoons of micronized Titanium Dioxide into 2 tablespoon of Sunflower or Sweet Almond Oil (or any other liquid oil). Finally, 1 teaspoon of Brown Oxide into 1 tablespoon of Sunflower or Sweet Almond Oil. Use a mini mixer to get the clumps of color worked out smoothly. 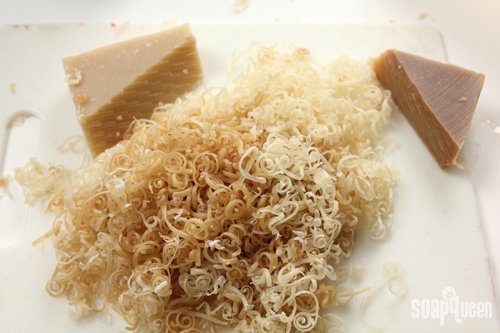 TOPPING PREP: To achieve the look of toasted coconut flakes on top, grate two different leftover bars of brown & tan cold process soap with a cheese grater. This step is optional and completely up to you, but the shavings do add a nice pop! ONE: Slowly and carefully add the lye to the coconut water and gently stir until the lye has fully dissolved. Set aside to cool. Be aware: the lye will do some strange things! 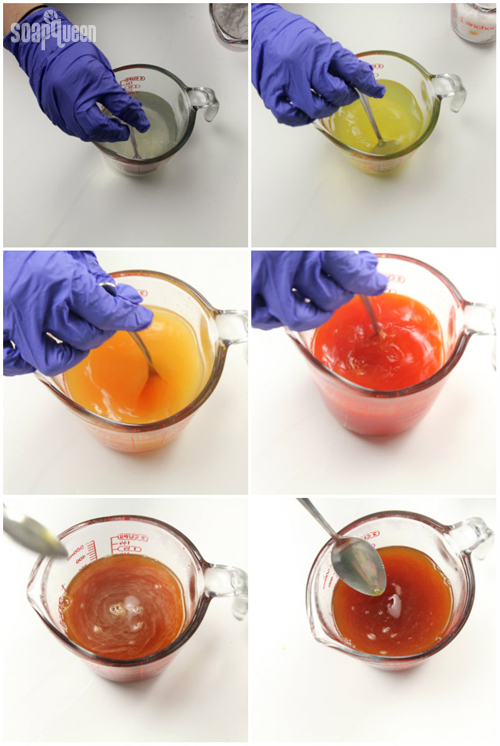 Check out this awesome progression of color as we added the lye to the liquid. You are watching the lye react with the sugars in the coconut water right before your eyes! TWO: Fully melt and combine the Olive, Coconut, Palm and Shea Butter. Once the lye water and the oils have cooled to 130 degrees or below (and are ideally within 10 degrees of each other), add the lye water to the oils and stick blend until thin trace. 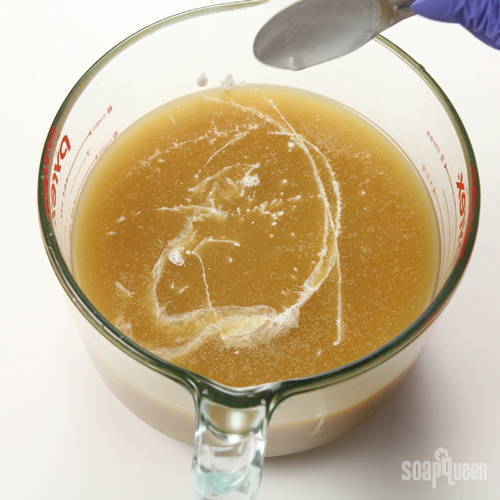 For a harder bar of soap that releases faster from the mold, add Sodium Lactate to the cooled lye water. Use 1 teaspoon of Sodium Lactate per pound of oils in the recipe. For this recipe, add about 2 tsp. Sodium Lactate. THREE: Once the batter has reached a light trace, add all of the Titanium Dioxide mixture. Stir with a whisk. 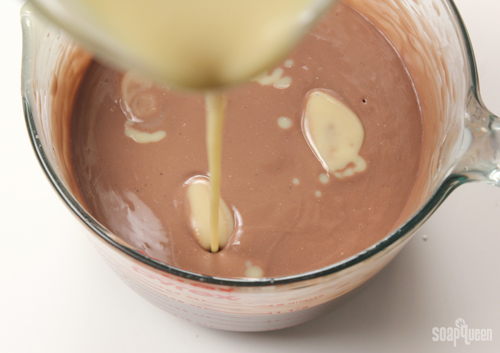 FOUR: Split off two cups of batter into a separate container. Set aside. FIVE: To the original batter, add all of the Brown Oxide mixture. Stir with a whisk. FIVE: The Coconut Cream Fragrance Oil will discolor soap to a light tan, so only add it to the dark brown soap to retain contrasting colors. 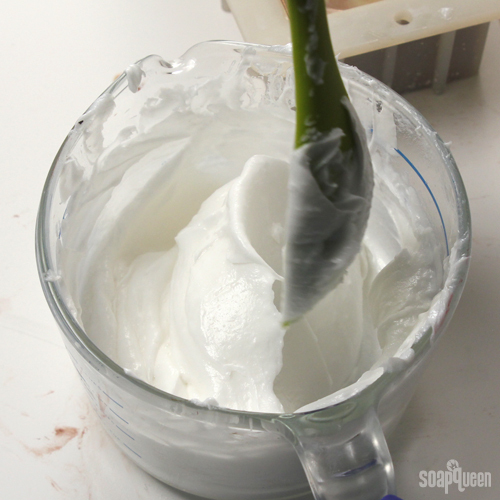 Add 2 ounces (by weight) of Coconut Cream Fragrance Oil. Stir with a whisk to incorporate. SIX: Now for the in-the-pot-swirl! 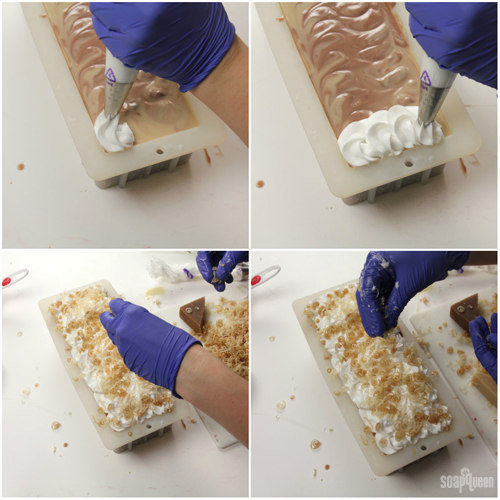 Pour the white soap into the brown soap in four places: 12 o’clock, 3 o’clock, 6 o’clock and 9 o’clock. Pour steadily from a high point to get the color all the way to the bottom of the container. SEVEN: Run a chopstick or dowel just once through the soap, hitting each entry point. Only swirl once because you don’t want to overmix! EIGHT: Hold and pour the soap steadily into the mold. Do not move the bowl as you pour. Tamp the mold on the table several times to disperse air bubbles. If you’d like, you can do a fun design on top, but be aware it will soon be covered by soapy frosting! NINE: Now make the soapy frosting. Cut and melt 4 oz. of White Melt and Pour base in the microwave on 10 second bursts. 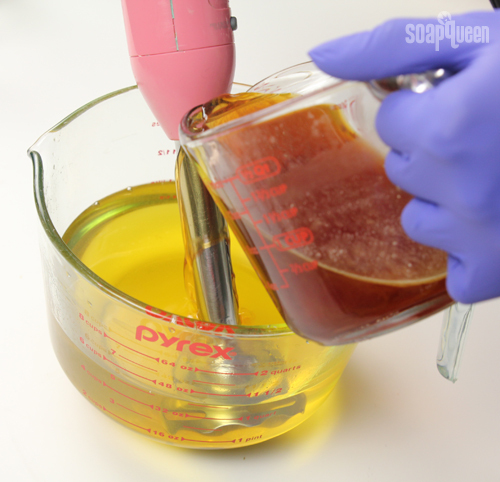 Once melted, add 3 mL of Chipotle Caramel Fragrance Oil and 3 mL Vanilla Color Stabilizer. Stir to incorporate. 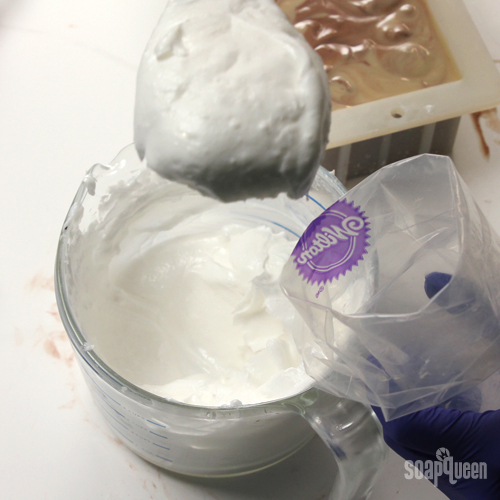 TEN: Add the White Melt and Pour to 16 ounces of Foaming Bath Whip. 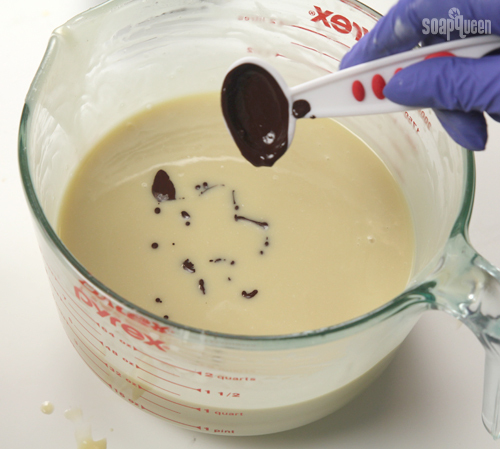 Using a hand mixer or stand mixer, whip the mixture until it can form stiff peaks (usually about 3 – 6 minutes of mixing). This is a good texture for the frosting. Notice that it’s stiff enough to hold its shape. ELEVEN: Cut about an inch off the Disposable Frosting Bag and insert the 1M Frosting tip. Then, fill the bag with frosting. TWELVE: Frost the top of the loaf. Make short fluffy rows down the length of the mold. 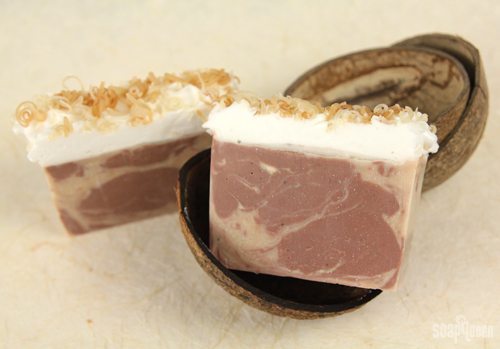 Garnish with your “coconut flake” soap shreds. Don’t be afraid to push them into the frosting to secure them. Allow the soap to sit in the mold for 3-4 days before unmolding. Keep in mind, the melt and pour frosting will not get as hard as cold process frosting. It won’t be sticky or tacky, but you will be able to push and dent the frosting so handle with care! After unmolding, cut into bars and allow to cure for 4-6 weeks and enjoy! Hi Anne Marie. I noticed that you said to pour the swirled soap without moving the vessel. My question is, did you hold the vessel at one end of the mould or did you focus it in the centre, letting it flow simultaneously to both ends? What causes cold processed soap to be crumbly? Several factors, such as more than 15% butter in your recipe, can cause crumbly soap. Do you mind if I ask what’s in your recipe? Also, what temperature did you soap at? Did you use any fragrance or color? Hey! Quick question: what’s the process you used to cut the bars? Did you flip the log over and cut from the bottom? If so, how did you do it without ruining the top design? Thanks! We unmolded this soap and put the log bottom side down. That means the frosting was on top. Then, we used a sharp knife to cut individual bars. I am SO disappointing with this foaming bath whip. I followed the directions EXACTLY as written and used my 9-bar mold. I had enough bath whip left over to frost another soap I made at the same time in a 2 lb mold. It’s 4 days later and this bath whip is still just like whipped cream – the slightest touch and it comes off in my hands as soft as whipping cream. I can’t get the first batch out of the 9-bar mold dividers and I can’t cut the 2 lb soap either. This has ruined not one, but 2 batches of soap. ARG!!! Next time I will do my usual and frost with CP soap. It’s always fun to try something, but not when it doesn’t deliver. I’m sorry this recipe was giving you trouble. I totally understand if you prefer cold process frosting. 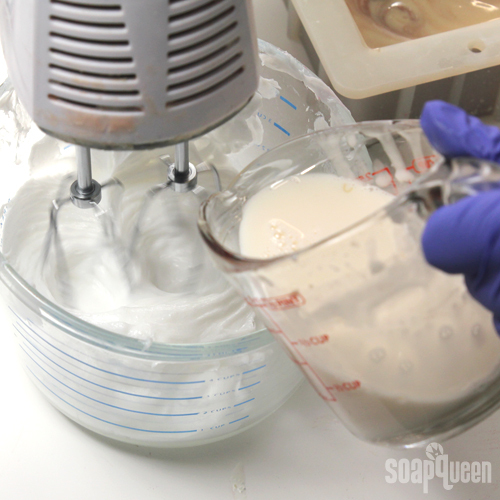 While it is a little softer, we found that the foaming bath whip frosting was stiff enough to hold its shape. It can take quite awhile to whip the soap enough so it will stiffen. Also, you can add a little more melt and pour if you like. This recipe looks wonderful. I would like to make it using the 9 bar wooden mold. 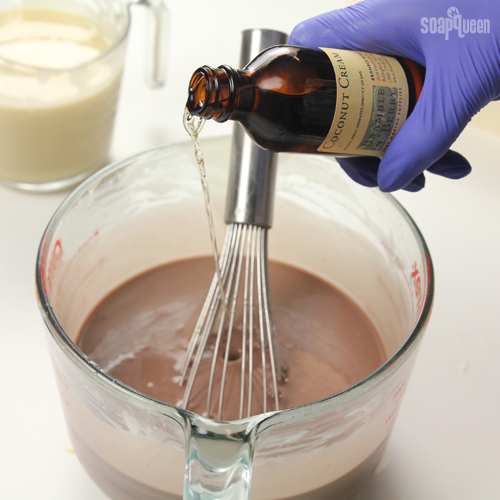 Question: How hard or how soft is the whipped foaming bath whip in this recipe? If I use this 9 bar horizontal mold, will all the foaming bath whip fall off in the shower on the first use or will it say on and just be a softer soap top? I haven’t used the foaming bath whip before. The frosting on this recipe is hard enough to hold its shape and isn’t sticky or tacky. However, it does dent if something bumps against it. I have a bar in my shower right now, and the frosting is staying on just fine! Good to know and great ideas!! Thank you so much! I can’t wait to try it. Hi, i cant find coconut water can i use cocnut milk unsweetened. Do i need to freeze it first. We would recommend freezing it first, as coconut milk that gets too hot can volcano! 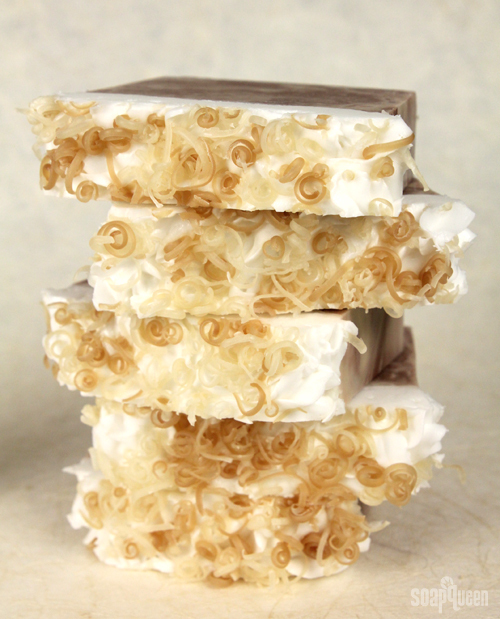 Hi, i was wondering that when doing the resipe you didnt say how to make the coconut soap for the coconut curls on top. So where do we get the soap to make the flakes on top. So glad you posted this it’s kind of ironic yesterday I mixed the lye with coconut water and it did exactly what your picture show and I thought I had ruined it and I throw it all away plus it smelled pretty funky. I think I’ll stick with coconut milk instead I didn’t like the smell of Rhw lye with the coconut water I was afraid it would overbear the fragrance which is so expensive I can’t afford to waste it. I love the frosting idea. For this tutorial, we used our new Coconut Cream Fragrance Oil, which smells like creamy coconut with hints of vanilla and almond. It’s one of my favorites! Hello there, I love making cold press soap as well as melt and pour but my cold press has trouble holding the fragrance or essential oil smell even when I as as much as is recommended, am I dining some thing wrong …. We usually recommend about .8 oz of fragrance per pound of cold process soap, depending on the fragrance. Where can I find the max amount of fragrance that is recommended? I have seen .7 and .8 oz of fragrance per pound for cold process soap listed here and on another page on this blog but would like to know what the actual max amount is. This tutorial couldn’t come at a better time because I am trying to decide whether to use cp or mp frosting to top my pumpkin hp soap I made a few days ago. I’m concerned that since my hp soap was made earlier this week mp soap won’t stick… What’s your take on this… Is it futile to try and frost fully cured soap? Would cp or mp work better? This recipe looks delicious btw I will be trying! If you frost your soap now it should stay on there fairly well! These soaps look really nice! I love the little curls on top as decoration! 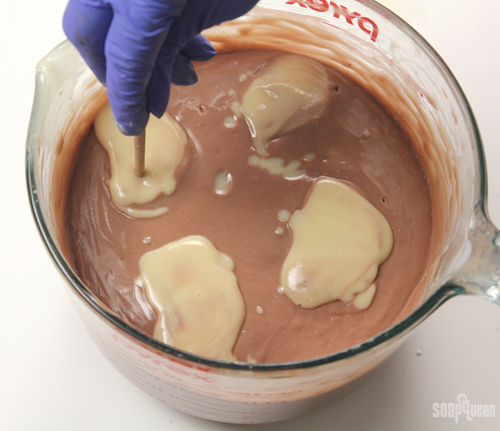 Is there a reason you make the frosting out of melt and pour instead of cold process? It looks awesome, but I’ve never experimented with Melt and Pour this way. The soap looks promising. Nice step by step explanation. I will try to make this soap when i have time. Keep posting interesting info like these. The soap is looking promising. Nice step by step explanation. 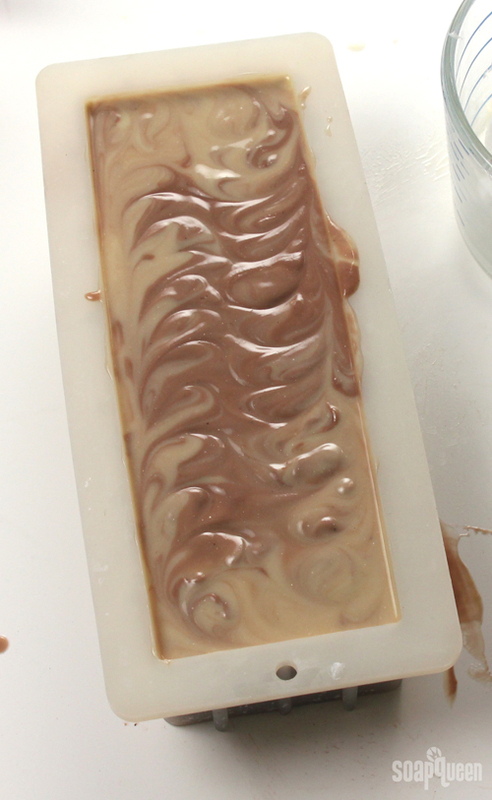 I will try to make this soap when i have time. Keep posting interesting info like these.